Residents and emergency workers in Houston are struggling to cope with intense flooding and rains brought by Hurricane Harvey. Volunteers use an airboat to rescue people from their flooded homes along Beamer Road in Houston on Sunday. People taking shelter at the convention center pick up food. Around midday Monday, Gov. Greg Abbott activated the entire Texas National Guard to support communities coping with the flooding. 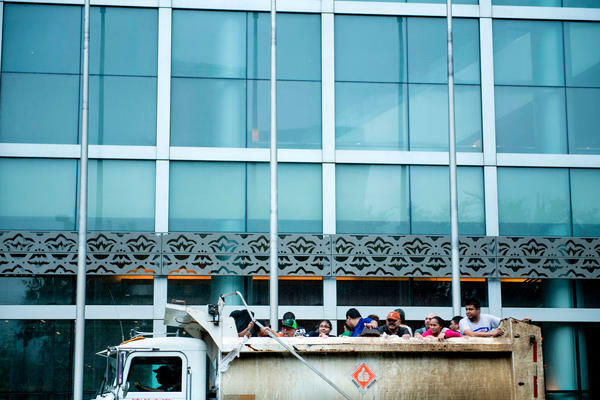 Flood victims are transported to the convention center. 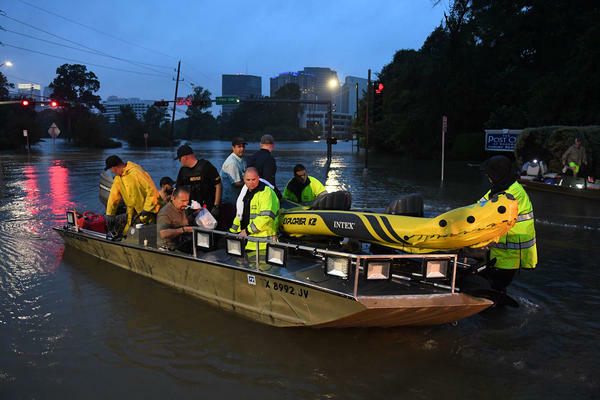 Houston set a new daily rainfall record Sunday, with 16.07 inches reported at the city's international airport, the National Weather Service says. 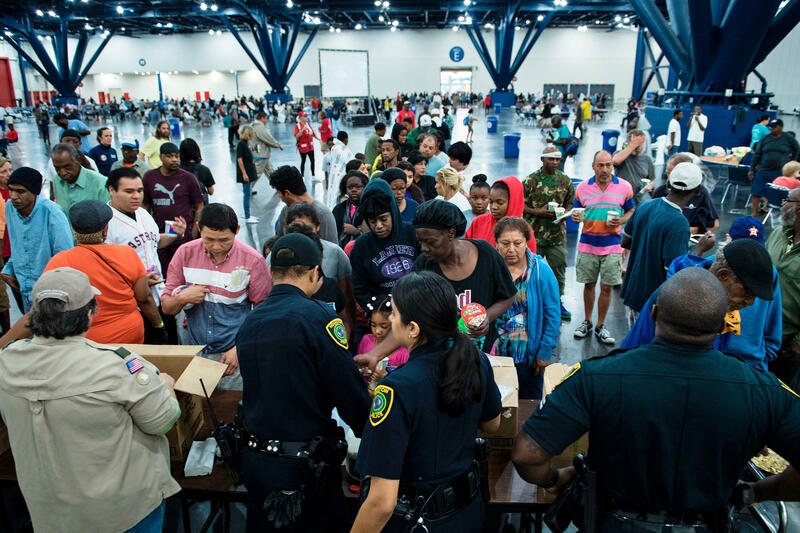 People arrive at a shelter in the George R. Brown Convention Center in Houston. People gather for food at a shelter in the convention center. Flooding unleashed by monster storm Harvey left Houston, the fourth-largest city in the United States, increasingly isolated as its airports and highways shut down and residents fled homes waist-deep in water. 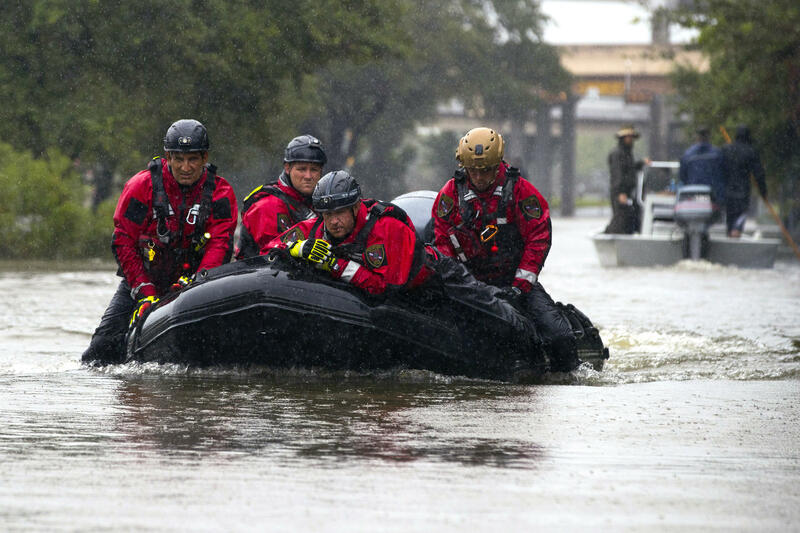 Houston Fire Department Dive Team members motor through high water looking for victims of the flooding from Hurricane Harvey. Houston residents Julian Fernandez (left) and Simon Loscertales survey the flooding next to Buffalo Bayou Park in Houston. "I am now a refugee," says Fernandez, whose neighborhood has flooded. Overhead view of the floods from Buffalo Bayou in Houston, as heavy rains continued falling in the area. 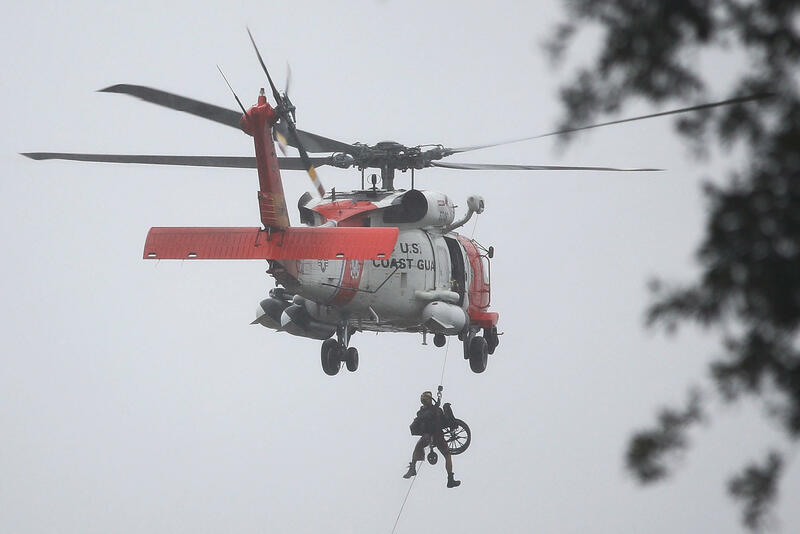 A Coast Guard helicopter hoists a wheel chair on board after lifting a person to safety from the area that was flooded in Houston. People are rescued from a flooded neighborhood after it was inundated with rain water. 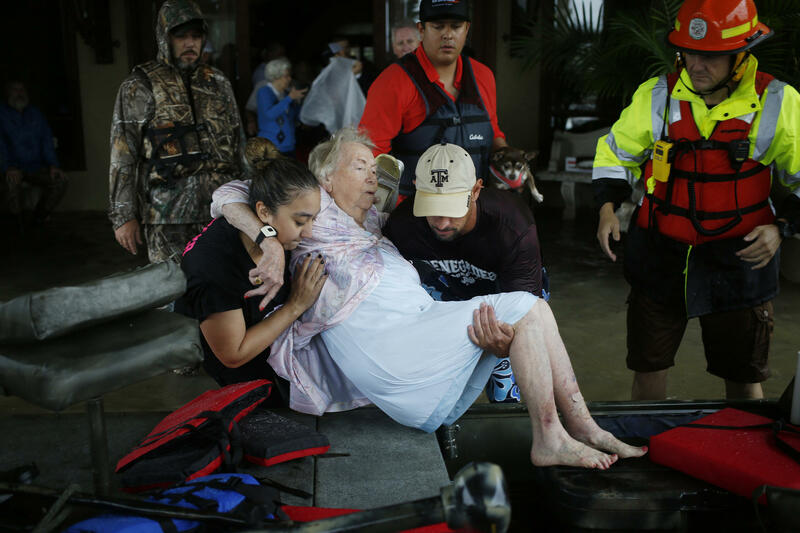 Rescuers help a woman from a flooded retirement home into a boat after Hurricane Harvey in Spring, Texas, on Monday. A deluge of rain and rising floodwaters left Houston immersed. 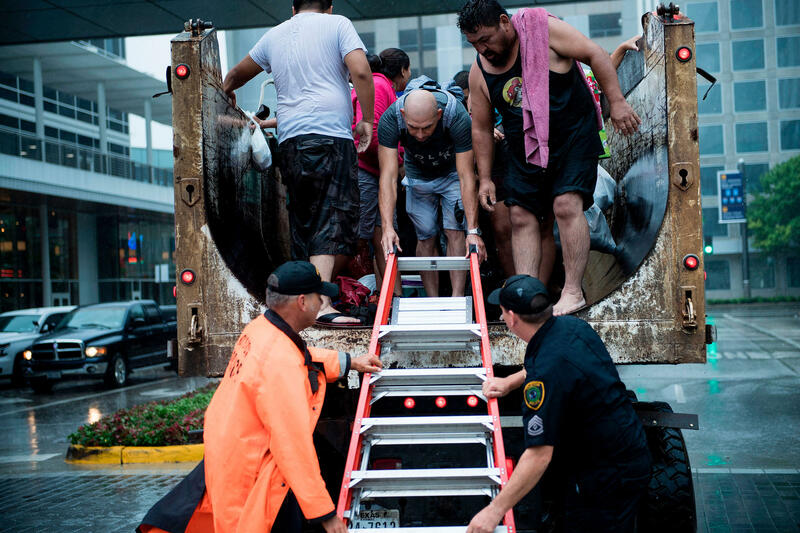 People are rescued from a hotel by boat after Hurricane Harvey caused heavy flooding in Houston on Sunday. "If we don't begin releasing now, the volume of uncontrolled water around the dams will be higher and have a greater impact on the surrounding communities," said Col. Lars Zetterstrom, commander of the U.S. Army Corps of Engineers Galveston District. He warned residents to stay vigilant as water levels rise. Several deaths have been reported in the floodwaters, but the exact number is unclear. A spokeswoman with the Harris County Institute of Forensic Sciences tells NPR at least six deaths are suspected of being related to the storm. Around midday Monday, Gov. 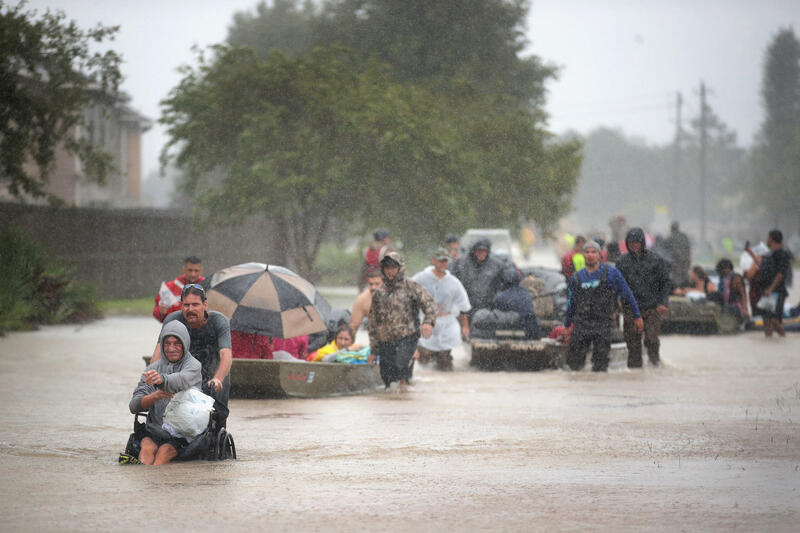 Greg Abbott activated the entire Texas National Guard to support communities coping with the flooding. Thousands of Guard members were already deployed in the effort; the number now stands at roughly 12,000. 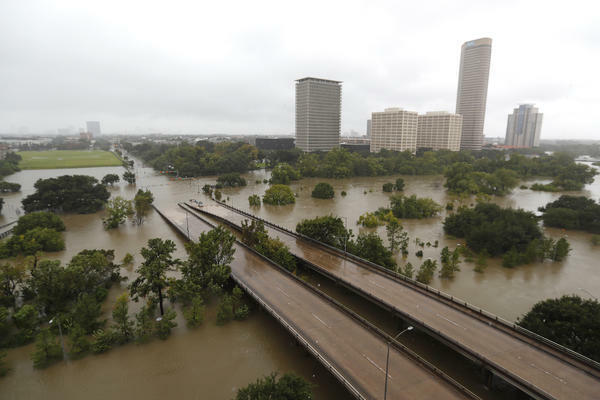 Gates to Houston's reservoirs were opened as emergency crews and residents scrambled to deal with the intense rains brought by Harvey, which became a tropical storm after making landfall as a Category 4 hurricane late Friday. Catastrophic floods are expected to continue. 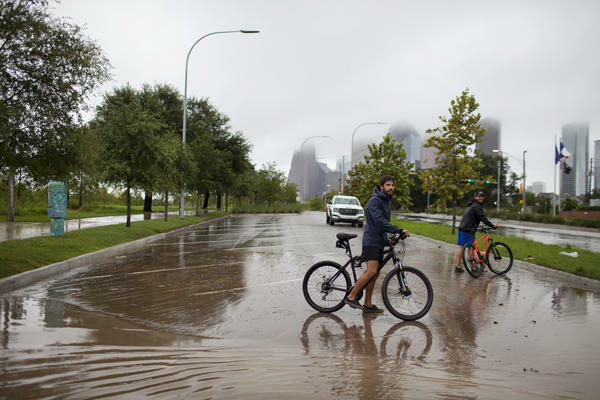 Houston set a new daily rainfall record Sunday, with 16.07 inches reported at the city's international airport, the National Weather Service says. On Saturday and Sunday, more than 2 feet of rain (24.44 inches) fell. The National Hurricane Center says an additional 15 to 25 inches of accumulation are expected across the upper Texas coast — which would lead to totals in some areas of 50 inches from just this storm. That's the average annual rainfall in the area. The U.S. Coast Guard says it is "conducting urban search and rescue in the city of Houston," acting alongside local police, fire and other agencies. "Officials are preparing to evacuate one of the nation's busiest trauma centers as flooding from Harvey threatened to compromise the hospital's supply of medicine and food," The Associated Press reports. Ben Taub Hospital has 350 patients to relocate, hopefully within one day, as floodwaters and sewage have infiltrated the building, the AP writes. Farther inland, officials are warning of flooding from rivers that are overwhelmed by massive rainfall. "The Colorado River at La Grange is expected to rise as high as 53 feet later this morning — 27 feet above flood stage," member station KUT reports. Meanwhile, President Trump has declared an emergency disaster in neighboring Louisiana, where the southwest portion of the state is bracing for an additional 15 to 25 inches of rain. The declaration, effective Aug. 27, authorizes the Federal Emergency Management Agency to bolster the response efforts of local authorities. "Protecting the lives of our people is our highest priority," Trump said at a press conference Monday afternoon. "Every asset at my command is at the disposal of local officials." 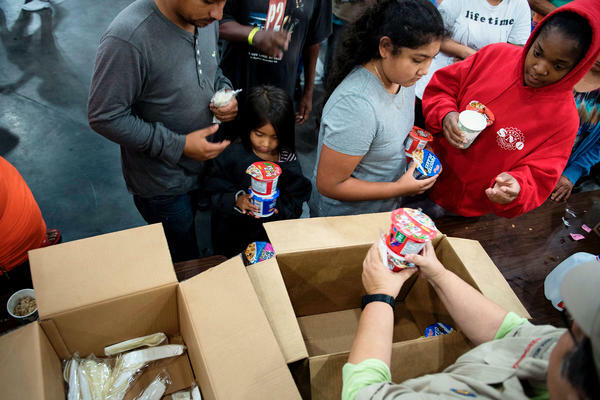 FEMA has already deployed more than 1,800 staff members and says it has more than 1 million meals to help those affected by the storm. Flooded portions of Houston and other parts of Texas will see more heavy rainfall on Monday, as the National Weather Service issued new flash flood warnings for a wide area from Galveston inland to College Station. "On Sunday, incessant rain covered much of Houston in turbid, gray-green water and turned streets into rivers navigable only by boat. 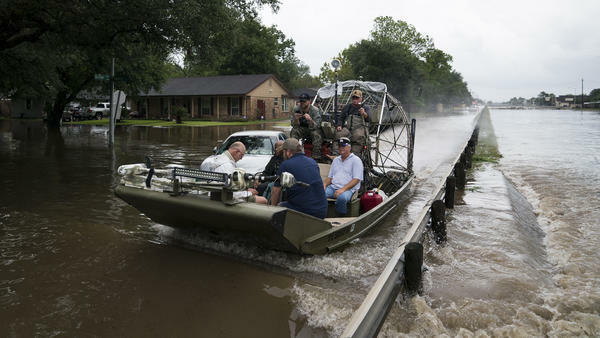 In a rescue effort that recalled the aftermath of Hurricane Katrina, helicopters landed near flooded freeways, airboats buzzed across submerged neighborhoods and high-water vehicles plowed through water-logged intersections. Some people managed with kayaks or canoes or swam. "Volunteers joined emergency teams in pulling people from their homes or from the water. The flooding was so widespread that authorities had trouble pinpointing the worst areas. They urged people to get on top of their houses to avoid becoming trapped in attics and to wave sheets or towels to draw attention to their location." With more rain to come, the ongoing storm has already capped off a three-month period in which Houston has received nearly a year's worth of rain, the National Weather Service says. The average yearly rainfall is just under 50 inches; Houston's airport has recorded more than 46 inches. Water has threatened to go around two reservoirs that protect the city's downtown from flooding. With both the Addicks and Barker reservoirs rising more than half a foot per hour, Zetterstrom said the goal is to give the water the most direct path to nearby Buffalo Bayou. A voluntary evacuation order went out to people who live around the dams, which sit on either side of I-10 west of Houston. "It's going to be better to release the water through the gates directly into Buffalo Bayou as opposed to letting it go around the end and through additional neighborhoods and ultimately into the bayou," he said. The Corps says the reservoirs' structures continue to perform as expected. 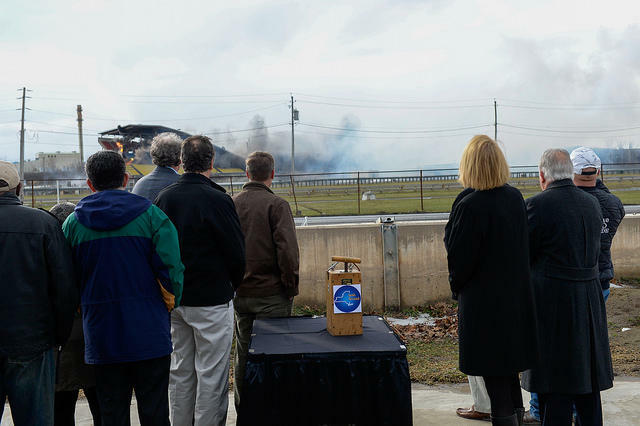 It planned to begin by releasing a combined 1,600 cubic feet per second, building up to a combined total of 8,000 cubic feet per second over the next six to 10 hours — but in an update posted around 1 p.m. local time, the agency said it had started with only a total release of 812 cubic feet per second and would be moving toward its goal of 8,000 cubic feet per second later Monday. The reservoirs' water would have a delayed impact, the Army Corps of Engineers says, with the first homes flooding some two to four hours after the initial release. Harvey could regain strength Monday and Tuesday, the National Hurricane Center says. The storm is drifting southeast — and its center has emerged once again off the middle Texas coast, a development that could bring a "slight restrengthening," the NHC says. It's likely to begin a slow northeast motion on Tuesday. As of midday Monday, Harvey's center was "near or just off the Texas coast south of Matagorda" and moving at nearly 5 mph, the hurricane center said. It later slowed back down to 3 mph. President Trump is planning to visit Texas on Tuesday to review the disaster's impact and emergency response, the White House says. On Sunday, the president held a teleconference with top administration officials to discuss the federal effort. 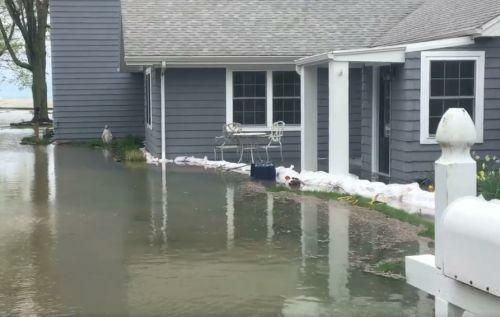 Owners of homes along the Lake Ontario shoreline - from Niagara County through Monroe County - were dealing with water coming over their breakwalls and sandbags, as the high lake levels and winds coming from the east and northeast pushed water onto the shore on Sunday. 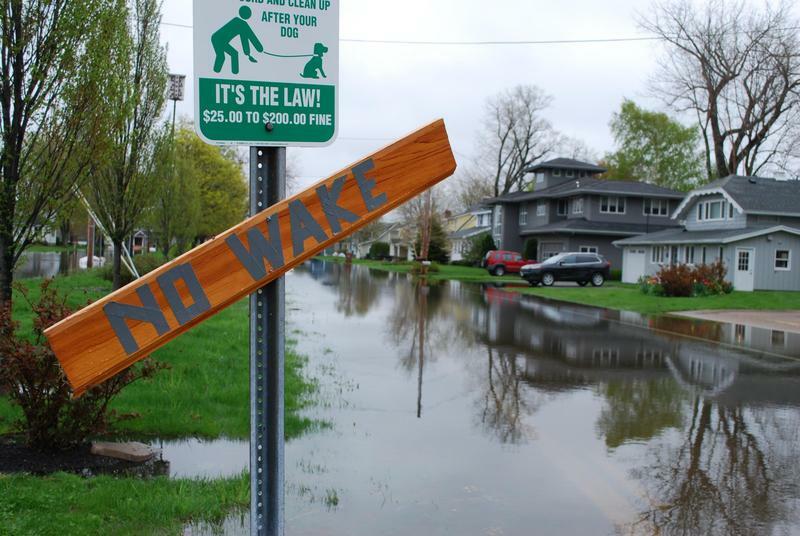 Did Plan 2014 cause Lake Ontario's floods? No, according to Frank Sciremammano. Sciremammano isn't an apologist for the new plan that regulates lake levels. He acknowledges that it could contribute to problems in the future. But he attributes this spring's flooding to record rainfall -- and some moves made this winter to manage ice. Buffalo, NY – The National Weather Service has issued a Tornado Warning for Northern Cattaraugus and East Central Chautauqua Counties until 7 p.m. Thursday. On Saturday Governor Andrew Cuomo accompanied by other state and Syracuse officials gathered at the New York State Fairgrounds to mark the beginning of site renovations.